After a new model phone is released, the previous generation's model will fall drastically. If you're looking forward to the next big smartphone announcement, it's best to lock in a trade-in price for your current smartphone beforehand. Phones on different networks may be worth different amounts. Unlocked phones or phones on AT&T or tend to be worth the most. Your phone's current condition has a big impact on its value. Phones in like-new condition earn a premium. Cracked, or otherwise damaged phones, won't be worth as much. Phones that don't work at all may not be worth anything. Though some companies will be interested in buying them for parts, most trade-in programs will say no. Anyone who accepts broken phones will be noted below. The older your phone is, the less it will be worth. Gear that's more than a couple of years old may not be worth anything at all, but you may be able to recycle it for free. Different color items may sell for different values, so be sure to select the right color. Personalization counts against you—a phone with personalized engraving will be worth less. Many trade-in programs want the power cable and sometimes other original accessories. If you don't have these, the phone will be worth less. Now that you know what to expect, let's look at the trade-in programs available and what they'll pay. In-store programs are the easiest way to quickly get cash for your device. All you have to do is take your phone to the local store and hand it over. You'll get a gift card for the phone's value immediately—or if you don’t agree with their assessment, you can take your phone back and walk away. The trade-off for convenience is price. These programs typically don't pay top dollar, and all of them pay you via a gift card, meaning you have to spend your money where you traded it in. Which site should you choose? Since all of these retailers pay in gift cards, the choice you make is really based on where you want to spend your money. If you don't need cash right now, a wide variety of online sales sites often give you better pay and, sometimes, options beyond gift cards. However, if the trade-in site disagrees with your assessment of the quality of your device, they may not pay as much as you expect—and you could be stuck with the lower rate or paying extra to get your phone back. Another thing you'll want to be aware of when you sell online is how long the price you're offered is good for: some require you to send in your phone immediately while others lock in your offer for weeks, giving you time to pick up a new smartphone before sending in the old one. Currently, Apple is offering the best trade-in deal at $225 for a 16GB iPhone 6s (or $160 for a 16GB iPhone 6). However, you're being paid in an Apple gift card, not cash. For cash, check out Glyde. You set your own price, but the site is currently citing $178 in your pocket as the surefire sale price (or $139 for a 16GB iPhone 6). Amazon Select what you're trading in, answer a few questions about its condition, then print a prepaid shipping label to send your item in. Smartphones, tablets, cameras, books, video games, wearables, MP3 players, movies, music, and more $200 as an Amazon gift card $130 as an Amazon gift card Within 12 business days of receiving your gadget Within 7 days When you submit your trade-in, you can choose what you want to do if it’s worth less than you thought — either have it returned, free of charge, or sell it for the evaluated price. Apple Select what you're trading in, answer a few questions about its condition, and Apple will ship you a prepaid shipping kit or let you print a prepaid shipping label to send your item in. iPhones, iPads, certain other smartphones, laptop and desktop computers $225 as an Apple gift card $160 as an Apple gift card 3-5 days after receiving your item Within 14 days Accept the evaluated price or have the device returned to you free of charge. Best Buy Select what you're trading in, answer a few questions about its condition, then print a prepaid UPS shipping label to send your item in. Smartphones, tablets, ereaders, MP3 players, video games, game consoles, computers, cameras, camcorders, and wearables $205 as a Best Buy gift card $135 as a Best Buy gift card 7-9 days after receiving your item Item must be received within 14 days You'll be paid the evaluated price. Gazelle Select what you're trading in, answer a few questions about its condition, then Gazelle will ship you a prepaid mailing box to send your item in. iPhones, iPads, Macs, and select other tablets and smartphones $180 by check, PayPal or as an Amazon gift card $110 by check, PayPal or as an Amazon gift card 3-5 business days after receiving your item for Amazon and PayPal or 7-10 business days for check Within 30 days Accept the evaluated price or have the device returned to you; you'll pay for shipping. Glyde Select what you're trading in, answer a few questions about its condition, and Glyde will suggest a price to sell it at auction on its website. Glyde takes 15% of the final sale price and charges a few dollars for a shipping kit (including packaging and shipping label), but the auction format will often still get you a better price. Smartphones, MacBooks, tablets, video games. Glyde accepts some broken smartphones. $212 to your bank, by Bitcoin, or by check (for a $2 fee), or guaranteed $187 $154 to your bank, by Bitcoin, or by check (for a $2 fee), or guaranteed $139 4 days after your item has arrived After you receive your shipping kit If someone buys your item and finds it isn’t in the condition they expect, they can return it to Glyde who will return it to you, free of charge, so you can relist it. If your item is repeatedly returned, you will be charged part of the cost of shipping. Select what you're trading in, answer a few questions about its condition, then Usell will show you the best offers on its network of professional buyers. Once you accept an offer, Usell will send you a prepaid shipping kit or let you print a prepaid shipping label to send your item in. Smartphones, iPods, iPads, textbooks, game consoles, gift cards. USell accepts some broken items. $177 by PayPal or check $117 by PayPay or Check Within 5 business days of receiving your device After you receive your shipping kit Accept the evaluated price or have the device returned to you free of charge. Walmart Select what you're trading in, answer a few questions about its condition Smartphones, tablets, video games, MP3 Players, eReaders, GPS $156 by Walmart eGift card $103 by Walmart eGift card Within 2 to 4 weeks of receipt of the product Immediately - you print out a prepaid shipping label You can choose to accept the revised price or have the item sent back free of charge. Verizon Select what you're trading in, answer a few questions about its condition, then Verizon will send you a prepaid shipping kit or let you print a prepaid shipping label to send your item in. Smartphones and tablets $178 as Verizon account credit for existing customers or a Verizon gift card for others N/A* Within 2 billing cycles After you receive your shipping kit You'll be paid the evaluated price. Before you ship your iPhone off, back up your documents, photos and videos to your computer or an cloud storage service. Applications can be backed up with iCloud. Then, disable "Find My iPhone Activation Lock" and reset your phone to factory settings. 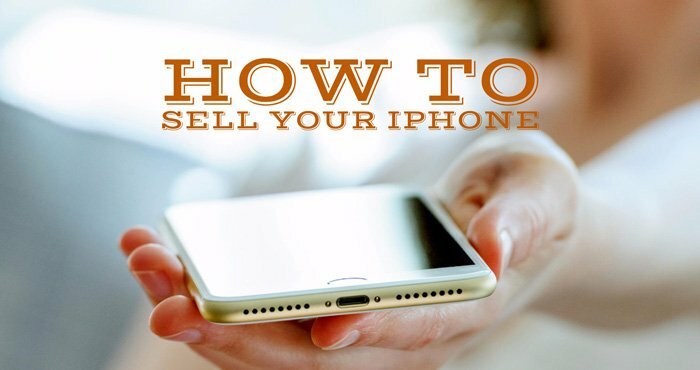 You can find step-by-step directions in my story 8 Things You Need to Delete Before Selling Your iPhone. Remove cases, screen protectors and your SIM card. Whatever you choose, good luck navigating the trade-in marketplace!